The following image and information was kindly supplied by John McKenzie in New Zealand who had some of these vases with more informative labels. 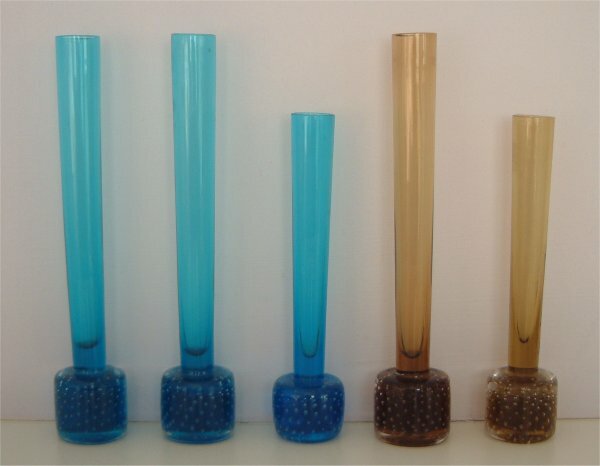 These showed that the vases were made by Ekenäs Glasbruk, Sweden before 1970. Ekenäs opened in 1917, and closed down in 1976 (last notable designers were J.O. Lake and Michael Bang). 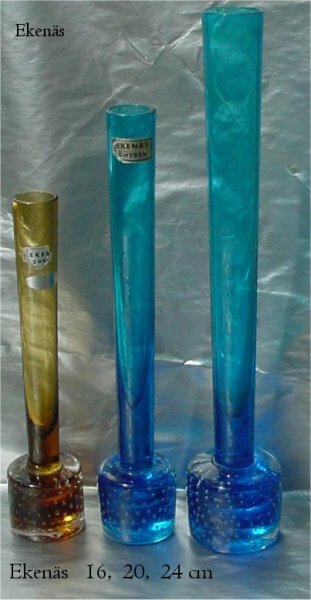 The amber vase is 16 cm, blue vase is 20cm, largest blue is 24 cm. 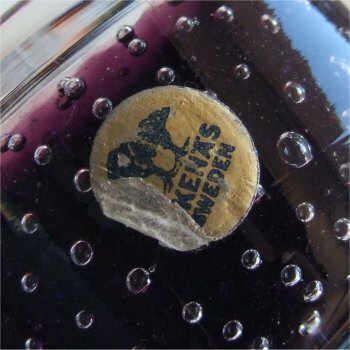 Labels are plain oblong black and silver with "Ekenäs Sweden"
The cylinder shaped base of this vase has an amethyst core and is encased in clear glass, it is 241mm (9 & 1/2") tall. 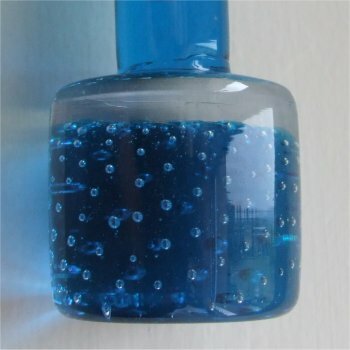 The bubbles are medium sized and come up in a spiral from the base. 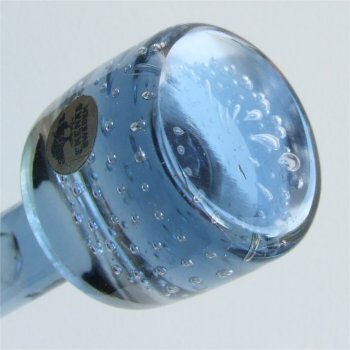 The stem is clear and has a narrow flare being 25mm (1") across the top. The bottom of the base is smooth and concave. 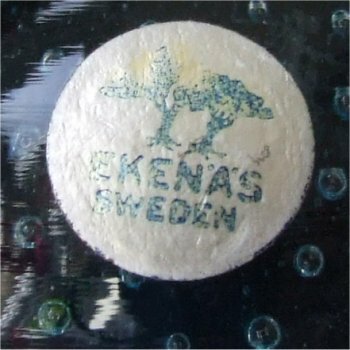 The paper label is round and a metalic gold colour with blue writing stating 'EKENÄS SWEDEN' above this is an image of two trees ( see images below). 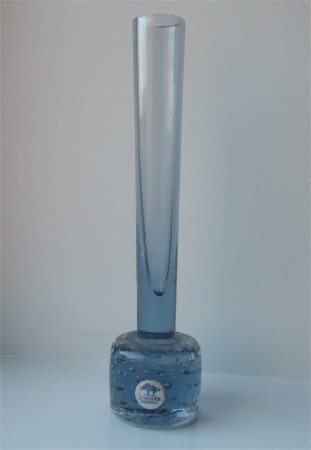 This vase has a cylinder shaped base, the core is blue and encased in clear glass. 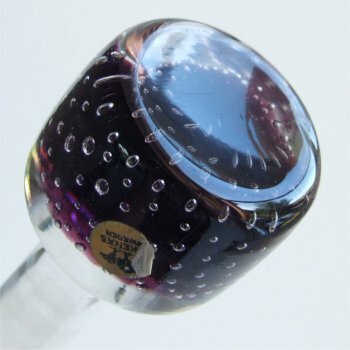 It is 162mm ( 6 & 3/8ths ") tall. 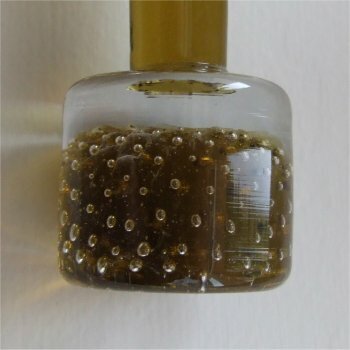 The bubbles are medium sized and mainly come up in a spiral from the base. The stem is the same blue as the core. 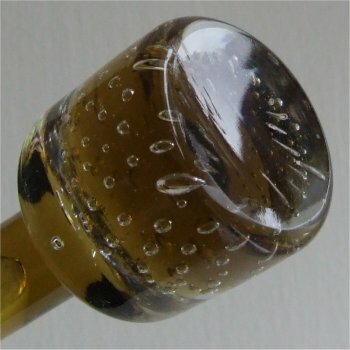 It has a narrow flare being 21mm (13/16ths of an inch) across the top. The bottom of the base is smooth and concave. 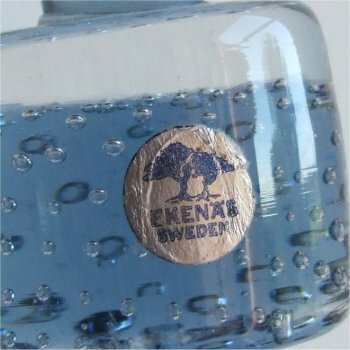 The paper label is round and a metalic silver colour with blue writing stating 'EKENÄS SWEDEN' above this is an image of two trees ( see images below). 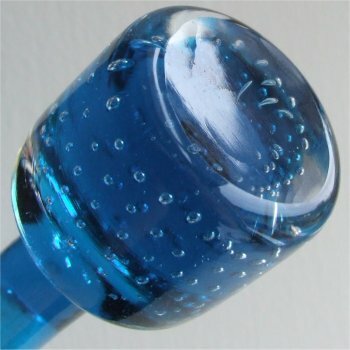 This kingfisher blue vase has a round ball base. 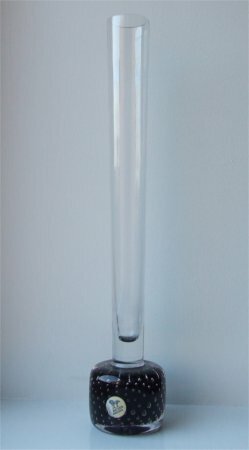 It is 240mm ( 9 & 7/16ths ") tall. 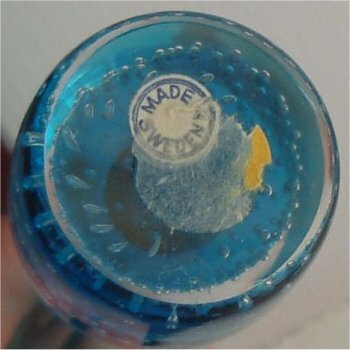 The bubbles are medium sized and come up in a spiral from the base. The stem is the same colour as the base. 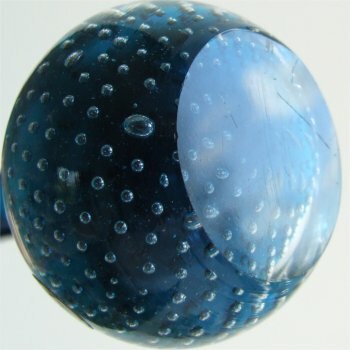 It has a wide flare being 35mm (1 & 3/8ths of an inch) across the top. The bottom of the base has a 'cut' and polished finish. 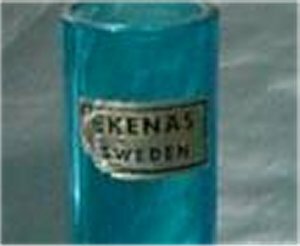 The paper label is round and a metalic gold faded to silver with blue writing stating 'EKENÄS SWEDEN' above this is an image of two trees ( see images below).